DBI Design impression of Pacific View Estate to be built in Worongary. 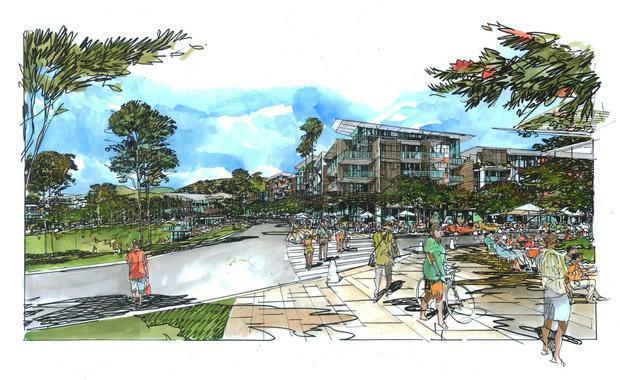 The Gold Coast's new suburb to be built at Worongary has finally received the seal of approval after the Queensland Government revealed the $1 billion project would now go ahead. Deputy Premier and Minister for Infrastructure, Local Government and Planning Jackie Trad made the announcement over the weekend saying the decision to approve Pacific View Estate at Worongary was part of the government's plan to deliver new jobs and infrastructure projects. "The proposed development was 'called-in' on 17 December 2014 at the request of the proponent, Pacific View Farm (Queensland) Pty Limited, and after careful consideration I have now made my decision to approve the estate based on a rigorous review by the department," Ms Trad said. The Pacific View Estate will have 3,500 new homes to house up to 10,000 residents, a village centre, commercial offices, a tavern and restaurants. "This development will create more than 2,700 jobs during construction - builders, carpenters, electricians, landscapers, and all their apprentices - and has the potential to contribute $3.2 billion to our state's economy," Ms Trad said. "The development will include an industrial precinct that will further support employment and provide an ongoing contribution to the Gold Coast's economic development. "In response to some concerns that were raised during the consultation process Ms Trad said that a number of infrastructure and environmental conditions have been imposed on the development. There will be a "provision of an Ecological Corridor Precinct" and green space as well as various upgrades to public transport in the immediate area. "There are plans to upgrade existing transport options and establish new ones such as bus routes, cycle lanes and railway connections which will ensure residents are well connected to the city and surrounding estates," Ms Trad said. Aerial view of the 342-hectare site where the Pacific View Estate will be built on the Gold Coast.